We would like to take this opportunity to express our appreciate to EduFirst & Teacher for her dedication in guiding Daniel throughout the year. Thank you very much! After (SA2 Results) 2 grades jump!! 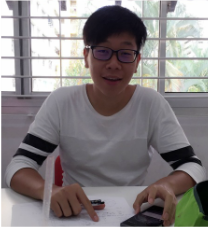 Xavier's Mom, Catherine, was so pleased with Xavier's tutor that after enrolling him for 1 subject, she decided to enrol him for another 2 more. 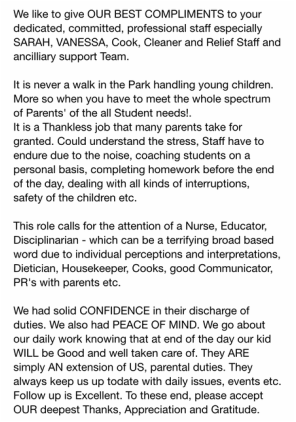 The above testimonial is written by our parent, Mr Chong who has sent his P1 child for our student care service. Valencia has been struggling with English since P5. 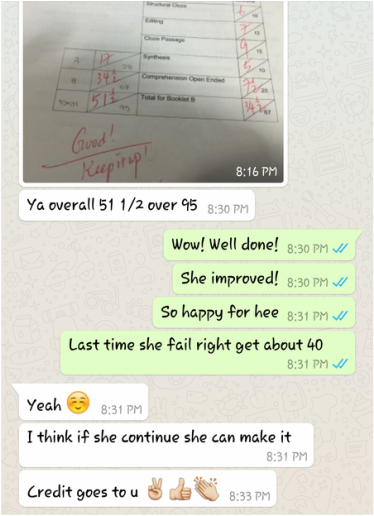 Her mom decide to enrol her with us few months before her PSLE in P6. She has always been failing English, in the 40+ marks range. 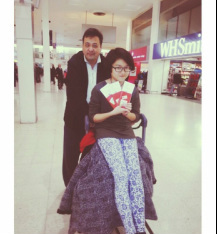 To finally pass her English was a big major milestone achieved for Valencia. Testimonial from our graduating Sec 4 student, Eunice Oh. Our student, Jamie, who attends tuition with us. She is under the tutelage of Teacher Bernard. An appreciation note from Student Nurul Ain (S4). She passed Chemistry for the very first time in her schooling years! Thank You card from Fatin (S4E). Her tutor has been giving her many extra lessons prior to her O'level Exam. I just want to say a whole lot of thanks for helping me improve tremendously in my Maths. Seeing you put in all that extra hours to help me, makes me want to work twice as hard to make you happy. Thank you for your kind gratitude towards me :) Cheers to more great years ahead!! 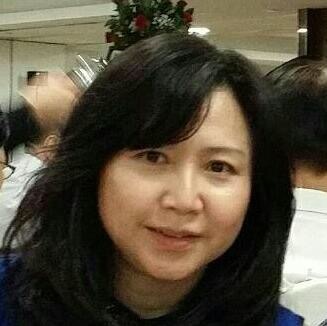 .Mother of Xin Xin (P4). Xin Xin has been with us since K2. 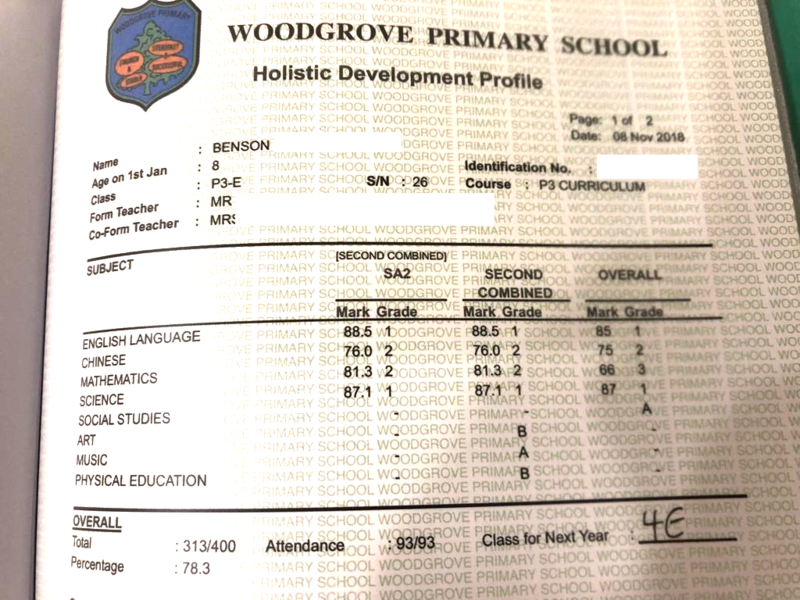 She scored 49/50 for her SA2 English and 98/100 for her SA2 Math examinations. 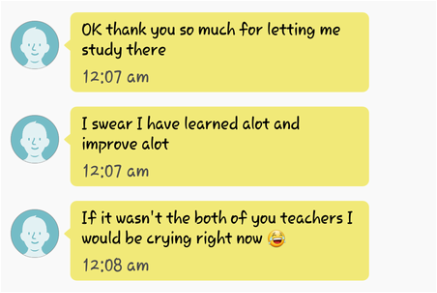 I like EduFirst Tuition Centre this is because I have improved alot on my weakest subject which is Math. I would like to say thank you to Miss May for nurturing me. Her lessons are very interesting and she is a caring and helpful teacher. She has taught me an easier method to solve the Math questions. When exams are nearing, she allowed me to stay longer to clear my doubts. There was one incident that i will always remember. Before my Math paper, i did my revision and i have difficulties answering one of the questions. I gave her a call and she helped me with the question. She has always been there for me when i needed extra help. 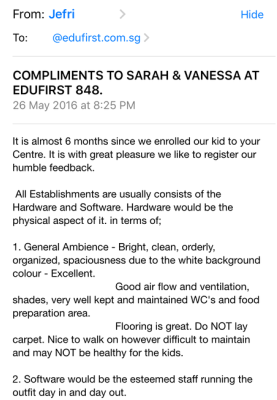 I will definitely come back to EduFirst even after my 'N' Level papers ended. I enrolled myself in EduFirst with a F9 in Maths (In sec 3). However, I achieved an A2 for my Prelims (S4). Teachers in EduFirst have developed a range of skills to allow me to become a more confident learner in all aspects. The teachers are very understanding and motivating. They are very experienced and can help me in tackling questions. Teachings have been very beneficial for me. Finally, I would like to thank Miss May. She has answered my call regarding my doubts on questions at late nights. Yun Sheng (S2E). 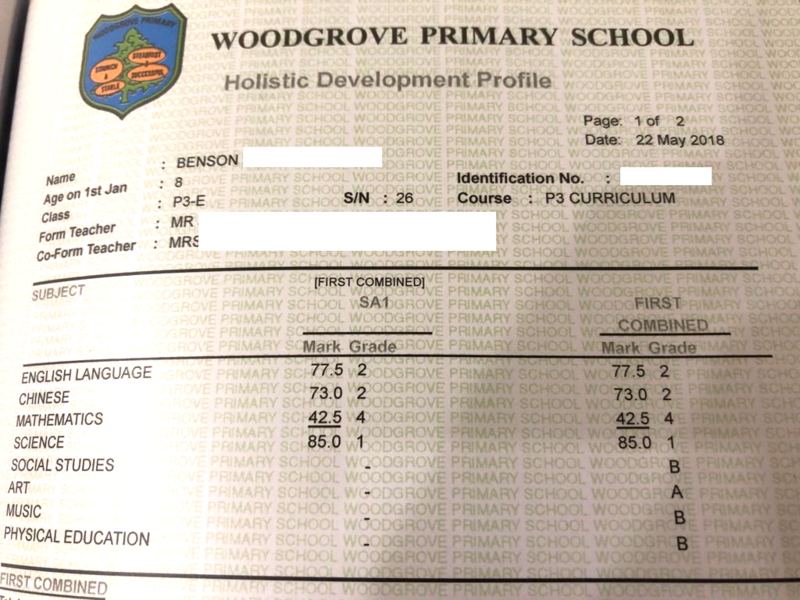 His science improved from E8 to B4 in only 2 months! Dear May, I would like to thank you and your team for helping Aigner score 4 A1s and 3 A2s in her final year examinations for Secondary 1. Aigner has now developed a love for Maths now which, one year ago, was a no-go subject for her. 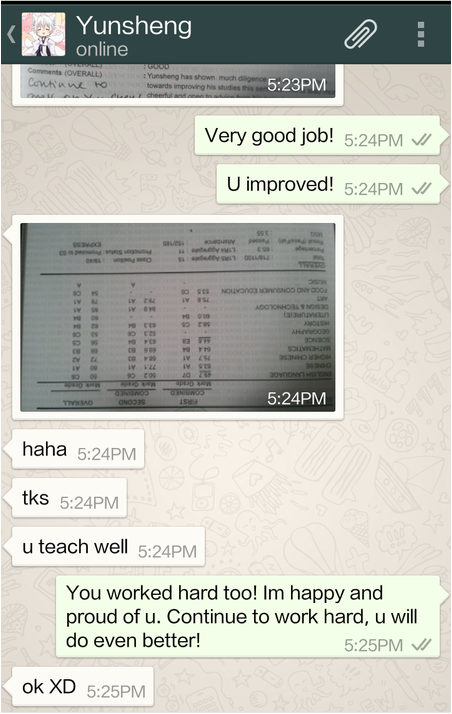 Aigner has indeed improved under your tutorial guidance. Thank you! I have recommended EduFirst to my friends! Ethan did well for his Science during the SA2 examinations and he loves his tutor at EduFirst. Thank you. I still remember that during Sec 1, when I was having difficulty coping with Algebra and you came in like a WONDERWOMAN and helped me buck up. THANK YOU VERY MUCH! Amalina got B3 for her English. Thank you so much. From a just-pass to a B3 is a great feat. Thanks again. She improved tremendously under your tutelage. Thanks for helping her reach her potential. Thank you for teaching us E math and A math for so long. Our maths did improve and we love the lessons! 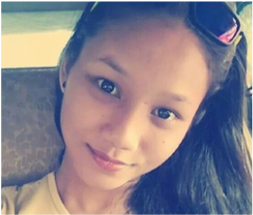 Thanks to EduFirst, Syafiqah has scored the highest in class for science. She has been failing science since Sec 1. Now, she enjoys learning chemistry! Thank you for your continuous support and guidance to Hani since last year. We appreciate very much. Her mathematics has improved. She used to fail Mathematics but now she is top 3 in class. Thank you for the love. Thank you for sharing your knowledge with us. 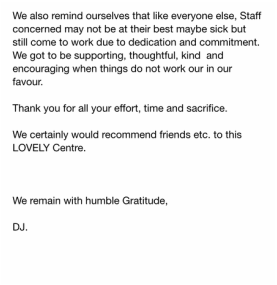 We are grateful for your concern towards us. Your explanations have benefitted us in many ways. The teachers here have taught us a lot and explained the sums and questions very clearly to us. I am very happy to have good teachers here at EduFirst.